On Sunday Kimberly McDonnell of Save A Puppy brought 14 animals into Canada from Aruba, after an overnight layover in Miami. Upon arrival in Canada the animals were turned away at Pearson International Airport. Save A Puppy has stated on its Facebook page the reason the animals were turned away was because there was a misunderstanding as to proper paperwork needed to admit the dogs into the country, they were misinformed by Canadian Customs. Save A Puppy has also contended all animals arrived with proper health records, health had nothing to do with the decision made by Canadian Customs, and they were not given a 24 hour period to rectify the situation, as required by law. 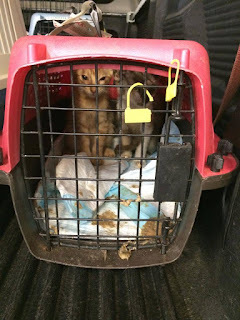 Yesterday Save A Puppy threatened to sue Canada Customs, American Airlines, and Pet Limo Services Inc., a pet transport service in Miami, for their negligence in this situation over the last two days. Later, Save A Puppy posted messages in appreciation of Pet Limo and American Airlines. It is not known if they still plan on launching a lawsuit against CBSA (Canadian Border Services Agency). According to Save A Puppy the animals will now begin transport back to Canada. Prior to Sunday's import, Ms McDonnell had been informed by the CBSA on two previous occasions she required proper documentation for any pets she intended to bring into Canada in the future, that what she was dong was illegal. In addition, the animals were turned away by CBSA for two reasons, lack of proper documentation and the poor health of the animals. According to Canadian law, CBSA allows up to 24 hours for such a situation to be rectified or availability of transportation, whichever comes first. In this case, American Airlines was flying back to Miami within that period. "American Airlines takes the well-being of our four-legged passengers very seriously. On July 12, a passenger traveling from Aruba through Miami to Toronto tried to enter Canada with 10 dogs and 4 cats. Canadian officials denied the animals entry. Our team in Toronto took care of the animals and put them on the next flight to Miami. Once in Miami, we contacted Pet Limo Animal Services to provide care. · The animals are back in the care of Pet Limo. Pet Limo is coordinating with the families in Canada, as well as the appropriate Canadian authorities, to complete the adoption process. As of now it is not known how these animals will be transported back to Canada or when they will be arriving. Here's wishing them a safe, healthy journey into the arms of their new families who are eagerly awaiting their arrival.